There are plenty home improvement projects to choose from, each with its own set of pros and cons. Some improve the overall design of one’s property from the inside while there are those which help boost a house’s curb appeal. 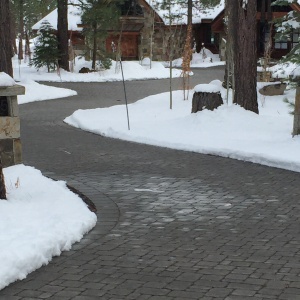 When it comes to something like heated driveways, the sole purpose of this home improvement option is to ensure that snow buildup never becomes a problem for the property owners. Countless hours are spent each year just shoveling snow and having to do this chore repeatedly over a period of months may become intolerable for some people. The thing about snow is that it can be a cause of stress even in regions where snowfall is minimal. If the homeowner suffers from limited mobility, having other people deal with the snow problem can cost a lot over a year. Without someone regularly shoveling snow out of a driveway, this homeowner may become more prone to accidents due to slippage and the like. With a driveway that is heated, the snow dilemma is addressed without the need for any shoveling or having to work with a snow blower. Heated driveways are heated up by radiant floor heating systems. These can be installed both on the inside and outside of the main house. A floor heating system works by melting the snow on the driveway without creating too much heat that may be damaging to vehicles or harmful to the people walking across it. These normally work with trigger sensors making them even safer not to mention economical to use. Basically, when the temperature drops to a certain level, a combination of heated water and antifreeze is pumped into some tubing and this is what generates the snow-melting heat. With a simple flick of a button, the homeowner has the ability to watch the snow melt without so much of a hassle. Homeowners who are interested in this kind of technology need not install a brand-new driveway. In most cases, the necessary tubing and switch wirings can be installed under the existing driveway. To reduce the costs of installation, it would be best to hire a contractor that can ensure minimal damage to the existing driveway. If the driveway does require replacing for the installation to push through without fail, the homeowner should consider the time of year, trees in proximity, soil compaction, and a whole lot of external factors that may have an effect on construction and resulting driveway quality. Many professionals suggest that if possible, homeowners simply choose to replace the entire driveway completely. This ensures that the new systems for the heated driveways will be installed correctly. Especially considering how warranties are not really provided for this kind of job, it is more cost-effective to start with something new rather than something revamped. With over 20 years of experience installing pavers, stone veneers and heated driveways, Eric’s Concrete Pavers promises their heated driveways installations will exceed your expectations. Our professional team will make sure that you get the quality you deserve. Choose from a range of hardscape options including concrete, permeable and pervious pavers, heated driveways pervious concrete and more! Come check out all our products and view our installation portfolio. Contact us today! I am looking to install a heated stone pathway from my house to our spa for the upcoming winter. Last year we used portable mats, but want a more permanent look. I live in Glenbrook, NV at Lake Tahoe. Please contact me by email so I can set up a time for you to spec the job.